Bathrooms are now as well decorated as bedrooms. In the past, bathrooms were simply viewed as places where you simply detoxify and cleanse your body. But now, bathrooms are considered as places of relaxation as well. Sometimes, they are even made to stand alone as a room in itself complete with all amenities. There are many bathroom styles you can choose from but for now, let’s focus on the traditional style. In modern times, it is surprising that there are still a lot of people who choose to go for the traditional bathroom design. The main reason for this is because it is more formal, elegant and luxurious than many other styles. What usually makes up a traditionally designed bathroom? The most important fixture found in this type of style is the bathtub. Usually a bathtub with claw feet is the focal point of a traditional bathroom style. When it comes to flooring, traditional bathrooms are usually covered with ceramic tiles, marble, slate or hardwood flooring. The walls are usually painted white or another calming color. Of course, we should not forget the lighting. In a traditionally styled bathroom, natural light or direct ceiling light is very important. Sometimes, chandeliers or scones are added to give the room a more elegant look. The fixtures usually have graceful lines like that of an arched faucet with porcelain handles. This looks luxurious but is not really heavy on the pocketbook. To accessorize, you can go for hand mirrors, wood boxes, a vanity bench, an antique glass or wash pitcher with basin with flowers in it, window treatments and wall arts with floral designs. Luxurious and elegant – that is what best describes a traditional style bathroom. 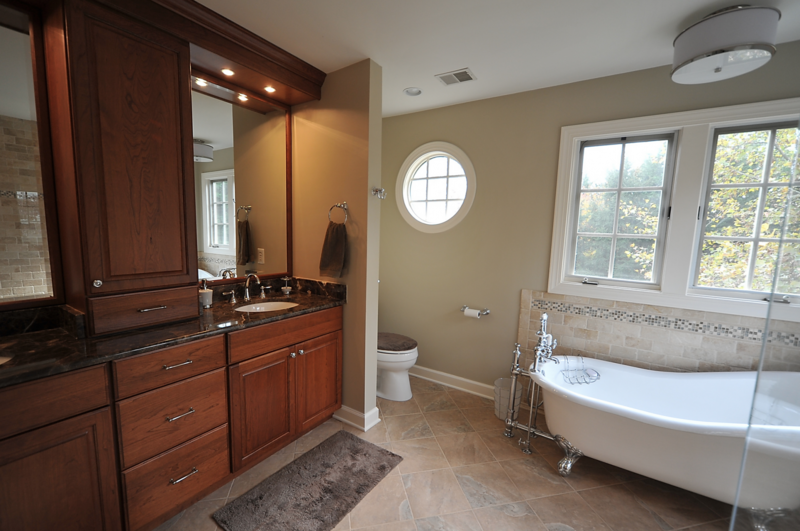 Visit with a Conestoga Showroom Specialist to help you with your traditional style bathroom.